[MARCH 29, 2003] Would you like to go on a journey of fun and adventures that may open up new worlds or take you back to your youth? Would you enjoy a learning experience and sport that can provide you with ways to do that? Would you enjoy a technological game that provides you with both a puzzle to solve and a cache to find? Rick Kidd and Rod Marshall, two geocaching participants, appear to be able to do just that when pursuing the sport of geocaching. Kidd and Marshall have been geocaching for a little over a year. Marshall first introduced Kidd to the sport. They have been enjoying geocaching since that time. So, besides being an adventure and being fun, what is geocaching? You can begin your excursion into geocaching by doing research on the geocaching website at www.geocaching.com. Geocaching is a sport that has rapidly grown in worldwide popularity since May 3, 2000. That's when the first cache, a container of goodies, was first hidden outside of Portland, Ore. As of March 28 this year there were 46,965 active caches in 165 countries. Here is the technical part of geocaching. There are 24 satellites 12,000 miles above the earth, tracking latitudes and longitudes for the GPS (global positioning system.) On May 1, 2000, the GPS was declassified by President Clinton, giving everyone access to the system and the ability to track geological coordinates. This opened up all kinds of new technologies, such as the Northstar system now found on some cars, and new techno-games such as geocaching. That is how geocaching began. Geocaching as a game can be as simple or as difficult as you want. There are two things that you need to participate in geocaching. You need access to the Internet, and you need a GPS device. "The GPS can be found at sporting good stores or department stores," Kidd said. "They range from $100 to $500 dollars, but you do not need the most expensive one to enjoy the game." The ones used by Kidd and Marshall are in the lower-mid price range. "There are a few rules that you need to follow when doing geocaching," Kidd said. "When hiding a cache you do not disturb the earth by burying the cache or by beating down or making new paths to your hiding place. You never put food items, lighters or matches, or pornographic materials in a cache. You always ask permission before placing a cache anywhere. You never hide a cache for profit or to attract people to your place of business." If you have the equipment you need and follow these rules, you are ready to start geocaching. You are ready to have fun. Go to the Internet to www.geocaching.com and type in your ZIP code or the ZIP code for the area that you are interested in. You will learn how many caches are in that area. "There are 204 caches within 100 miles of Lincoln and 103 caches within 50 miles of Lincoln," Kidd said. On a recent Sunday they visited four caches in and around Lincoln. There are at least three caches within a three-block radius of downtown Lincoln, beginning at Scully Park and moving to the Lincoln Public Library. These caches are driven by, walked past and used every day by people who never notice them. One of these, Marshall said, is called "in plain sight." He said, "I would not have found it myself, and it was right in front of my eyes. My 11-year-old daughter, Shelby, discovered it after we had followed all of the clues and coordinates on the GPS to where the cache was hidden. I still didn't see it but Shelby did." Kidd says his daughter Stephanie often joins him when he goes to look for caches. This is a very family-oriented game. To hide a cache you will usually want to use a small container, no larger than a 1-gallon metal or ammo container. You put a log book in the container so that when people find it they can log in. "The log book keeps people honest about how many caches they have found," both Kidd and Marshall stated. People involved in geocaching often compete with each other to see who can find the most caches. Kidd and Marshall are currently in a tight race with each other. Marshall claims to have 61 finds, while Kidd has 60. People use the geocaching website to tell stories about their finds; however, if they do not sign the log book, their find is not recognized as official. Another thing that is good to put in your cache is a note explaining what geocaching is so that people who stumble upon the cache accidentally will not disturb it. There are many variations on the kinds of caches; these include virtual caches, offset caches, microcaches, puzzle caches, multistage caches and traditional caches, or you can develop your own variation. "New ones crop up every day," a participant said. Once you have developed your cache and hidden it, you enter the coordinates using the GPS, a description and clues on the geocaching website. On a Sunday outing, Kidd and Marshall visited several neat and interesting cache sites. One of the sites had a book theme. The cache was in a larger container and could be seen as you approached it. This cache contained books -- many good paperbacks. The idea behind this book cache is to take some books from it that you would like to read and replace them with other books. Many caches are filled with little toys or things kids would enjoy. Another cache they visited was a multistage cache. This cache was called the Abe in Lincoln cache. The cache was partially a puzzle with clues that led them to various Lincoln attractions. At each attraction another part of the puzzle was revealed. Eventually the puzzle led them to Madigan State Park where they hiked through the fields and woods until they were near Salt Creek, where they looked for and found the cache that contained Lincoln items and Lincoln tourism items. There was one other item that was found in the Abe in Lincoln cache. This was a travel bug. Travel bugs are dog tags with serial numbers on them. People place travel bugs in a cache, and the person who finds it takes the travel bug and places it in another cache. In the forum on the website, they then log the number of miles the travel bug has traveled. "Some travel bugs have traveled over 10,000 miles," Rick said. "One flew on a fighter jet in Bosnia. This is just one other fascinating part of geocaching. I mailed one travel bug to Australia, where it would begin its journey." Kidd and Marshall said that they had just visited the Jesus cache. This is one of their favorite caches. The Jesus cache is along the Mississippi River near Hannibal, Mo. To begin the trip to this cache, you first travel on a winding trail, but the cache is placed on a 500-foot cliff that can be reached only by using ropes and climbing. The scenery was beautiful, the terrain was rough. Only about two others have reached this cache and signed the log book. Caches are rated on the website at 1-5 for degree of difficulty. They can be double rated for physical challenge and for mental challenge. Kidd and Marshall rated the Jesus cache at 4.5. "Five-point caches often need special equipment such as canoes or scuba gear, depending upon where they are hidden" Marshall said. A 14-person panel judges a cache's degree of difficulty before entering it on the website. This information helps people when they are choosing caches to look for. The panel also determines if a new cache meets all of the geocaching rules. As you can see, geocaching has many facets. It is family-oriented, it can be great physical exercise, and it is educational. Geocaching provides you with an opportunity to do things with your kids or to meet new people. It is a way to get up off the couch on a Sunday afternoon and spend some time doing something interesting. It is an opportunity to visit scenic and beautiful places. You can leave something for people to find or you can find hidden treasures. You can add geocaching to vacations and trips, stopping to stretch your legs along the way to find caches. You can also travel all over just to find caches. You can clean up the environment while you are hiding or looking for caches. "Cache in, trash out," is a popular part of geocaching. Doesn't geocaching sound like fun? Now, whenever you walk down a street in Lincoln, hike through a park or drive down a road, you may find yourself wondering if there is something more there than meets the eye. Geocaching can open new worlds for you. It can lead you to look for treasures, adventure and ways to solve puzzles in the world today just as when you were young. If you would like to find out more about geocaching, visit www.geocaching.com. [APRIL 16, 2003] "Adoptable Dog." John Ross and Barbara McKinney, W.W. Norton & Co., 2003, 353 pages. According to the United States Humane Society approximately four to five million dogs enter animal shelters annually. Of these almost half are euthanized while the other half are adopted. Since there are an estimated 25 million adopted dogs living in America, it is important that their owners have access to the latest information on dog care, feeding and training. In their new book "Adoptive Dog: Teaching Your Adopted Pet to Obey, Trust, and Love You," nationally known dog training experts John Ross and Barbara McKinney have developed a comprehensive training and obedience program for potential owners of adopted dogs. In the preface Ross writes, "'Adoptive Dog' speaks to the millions of dog owners out there who need guidance for living comfortably with their adopted pet. … I recognized long ago that adopted dogs often have special needs. I have incorporated unique material into my training programs for this vast dog population." In deciding on the right dog to adopt, the authors examine the pros and cons of adoption. They offer ways to help make for a smooth selection process, how to evaluate adoption resources and tips on picking the perfect pet. There's also a passage in this chapter containing an interesting contrast between the "pampered pooch" and the "street waif," as well as a brief quiz to help prospective owners find the right dog for their lifestyle. It is crucial that owners establish the proper surroundings for a dog prior to adoption. This includes learning how to communicate with your pet, establishing your dominance as the "pack leader," and developing the loving bonds between pet and owner. Owners can bond with their dogs through simulated hunting, food sharing, car rides, socialization with other dogs and obedience training. "Problem Solving for Your Adopted Dog"
This is one of the most informative chapters in the book. Obedience training is essential to any successful relationship with a dog. The authors address the most common dog obedience problems, including housebreaking, biting, excessive barking, eating, separation anxiety, shyness and the scars of abuse. One of the most frustrating problems in training a dog is excessive barking; Ross and McKinney suggest an innovative seven-point plan to curb unwanted behavior. (Try leaving an unwashed item with your scent on the bed. It may provide the dog security while you are away). In order to train your dog to behave, you must exhibit common sense when working with the animal, use the right equipment for the job and work in the proper training environment. The right equipment includes training leashes, collars, harnesses and halters. The basic commands demonstrated in this chapter are sit, down, sit-stay, down-stay, come and greeting people without jumping. There are several photographs demonstrating the different steps of these commands. It is important that owners not ignore the other responsibilities of owning a dog. Regular exercise and grooming are part of a weekly regimen of dog care. Owners also have to consider the dog's relationship in a household that contains children or other pets. Spaying and neutering is always on the mind of any owner. The authors shatter some of the most widely held misconceptions associated with these procedures (spaying or neutering does not automatically make a dog fat). Generally it is a lack of exercise that can cause weight problems in dogs. This can be eliminated by dog exercises such as hikes, leash walks, retrieving, swimming and doggie games. "Adoptive Dog" is a well-researched and enlightening contribution to the literature of dog care and training. The book's division into broad subject categories, chapters and sub-chapters make it easy to locate information on any particular topic. 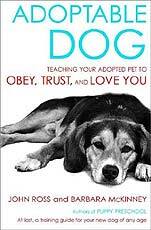 Ross states that the goal of this book is "to help keep adopted dogs with their new owners." He hopes "that you find it useful -- and that your adopted dog has found with you a lifelong home and family." This book is recommended for dog lovers everywhere or anyone who is considering adopting a dog as a pet. [MARCH 26, 2003] Preparing for the 32nd year of live summer theater for the Logan County area, Lincoln Community Theatre's 2003 membership campaign kicked off this month. Season tickets for the summer are $20 for adults and $12 for students through eighth grade.